After watching her grandmother, who is living with dementia, successfully read a wordy newspaper headline out loud, Rachel Thompson, a then-University of Waterloo student, had an “aha” moment. Thompson began to hunt for books catered to people living with dementia, with large clear words, laid out simply. When she couldn’t find anything on the market, she decided to publish her own. In the fall of 2016, Ontario-based Marlena Books (Marlena being a combination of Thompson’s grandmothers’ names) was launched. Offering dementia friendly writing, layout and content — at a grade five level of reading — Marlena Books work to engage the minds of those with dementia with age-appropriate themes and easy-to-read content. The books also feature wider margins and prompt for when to turn the page. “Reading is something that is so based in our childhood, something that is so comforting and familiar to everyone and we wanted to preserve that,” says Thompson. Photo courtesy Vytality At Home. Vytality At Home, a home care company that launched in Calgary in September 2018, connects home care workers with people living with dementia and has created an app that offers insight into those visits. Through its app, which can be used on a smartphone, tablet or laptop, loved ones are alerted to valuable information like when a Vytality At Home care worker arrives, leaves and what they did that day. They can also video conference or call family members during the visit. “This gives the family that ability to know and be hands-on without having to physically be there with their loved one while they’re receiving the care,” says Nicole Dyer, co-founder of Vytality At Home. For more information, visit vytality.ca. Photo courtesy Monarch Adaptive Clothes. Kristine Goulet was visiting her mother, who was living with dementia in long-term care, when she noticed the back of her mom’s shirt was open. Goulet’s mother, François Blanchette, was wearing “adaptive” clothing but she was still left exposed. “It’s an incredible struggle for the person doing the dressing, but also the person getting dressed can be robbed of their self-esteem and self-worth,” says Goulet. Inspired by her mother’s experience, and together with her friend-turned-Monarch co-founder, Pat Quinn, Goulet began designing clothing that was easy to put on and secure but was also beautiful. Monarch Clothes come in a variety of styles such as an “Easy-On T-Shirt” with snaps along the side and trousers with side snaps on the top. The clothes are available in a retail location in Sherbrooke, Quebec, and on Monarch’s e-commerce site, and shoppers can watch tutorials on how the clothing works with helpful photos and videos — some feature co-founder Quinn’s mother, who is living with early-stage dementia. Visit monarchclothes.com to learn more. Photo courtesy Ambient Activity Technology. Ambient Activity Technology’s flagship product ABBY provides stimulating, self-directed recreational activity for people living with dementia in long-term care facilities. Designed by the minds that have created a number of play areas, including in the Alberta Children’s Hospital, ABBY is a wall-mounted multi-activity stimulus centre. Thanks to wearable Bluetooth devices programmed with personalized information and preferences, ABBY can create customized experiences tailored to individual residents. 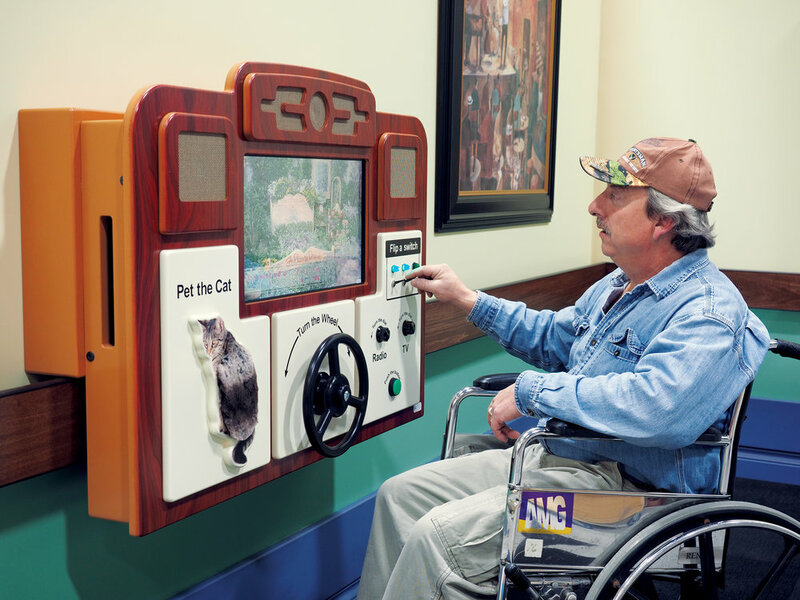 It can include wheels, buttons, an old-school radio — that plays familiar songs — textured images of animals, a touchscreen that displays personal photos, and more.